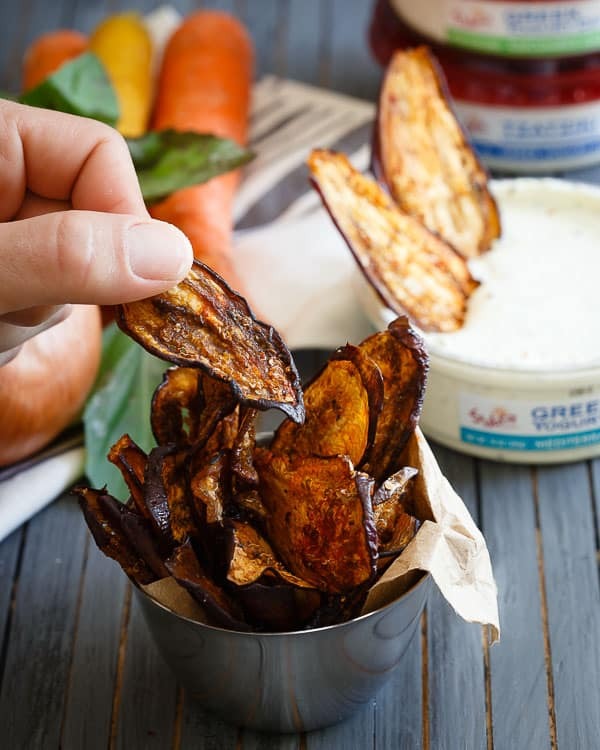 These eggplant chips are flavored with an array of Mediterranean spices, made crispy in the dehydrator and perfect for snacking when paired with your favorite healthy dip. At the end of last month I spent a couple of days in NYC visiting the Sabra factory that produces their Greek yogurt dips. Did you even know Sabra made Greek yogurt dips? I’m not gonna lie, until last year, I didn’t even though they launched in 2010. It’s probably just the craptastic grocery stores near me but I never saw anything besides hummus from Sabra. Now, I totally love hummus but Greek yogurt dip? That stuff has my Greek by marriage heart. Our trip began with a night in a rented out professional kitchen where we snacked on Greek yogurt dip, veggies, chips and the most amazing fresh berries I’ve ever tasted. They have nothing to do with anything in this post I just feel the need to share that because I’ve literally never tasted a blackberry that good before in my entire life. All the bloggers on the trip were in charge of one component of the meal. Brandy chose booze and I chose meat. If you’ve watched any Kick Sass Kitchen videos, none of that should surprise you. I actually made my balsamic dijon crusted beef tenderloin for everyone and nervously drank 2 bourbon concoctions while it cooked afraid that sans meat thermometer I was going to overcook a $200+ piece of meat. I didn’t, it turned out fine, maybe just a little tipsy by dinnertime. The next day we met with Sabra’s marketing team in the city before heading out to Long Island to see the factory and production. The team showed us some new campaign ideas and thoughts about how to really get consumers to understand the key differences between Sabra’s Greek yogurt dips and other competitive brands like the fact that Sabra has more protein, fresh vegetables make up 20% of the product (and they’re 100% farm fresh) and there are absolutely no artificial flavors. When we walked into the factory and one of the first things I saw were HUGE containers of freshly diced cucumbers and an employee seeding bell peppers by hand, everything the marketing team had told us earlier came to life. Not only are the vegetables that go into the Greek yogurt dips as fresh as possible, the Greek yogurt itself is also made on site. I don’t know why I assumed it wasn’t, but I was a bit surprised to learn that. One of the two factory buildings is completely devoted to making the Greek yogurt itself before the vegetables get mixed in and packaged for distribution. We ended the tour with a sampling and we all attacked the dips, veggies and chip spread like we hadn’t eaten breakfast just 3 hours earlier. 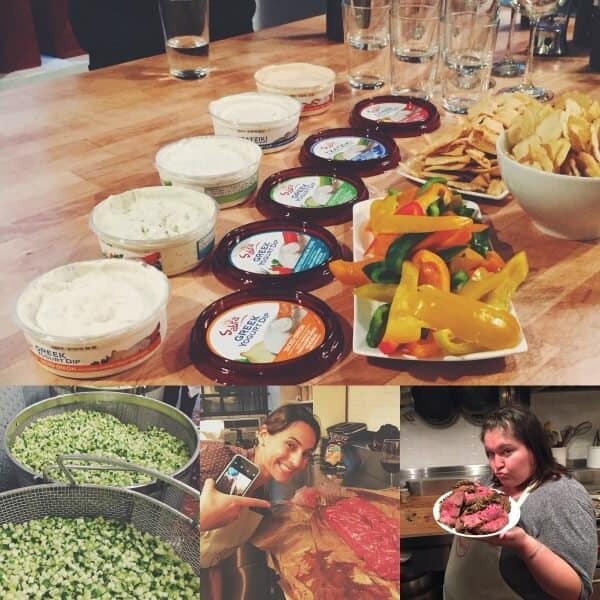 All the dip tasting got me thinking which I preferred more, the chip + yogurt dip or the veggie + yogurt dip combo and honestly, it was a toss up. I’d go back and forth multiple times and never really decide on a clear cut winner. Which is why I decided veggie chips would be the ultimate dipping accessory. 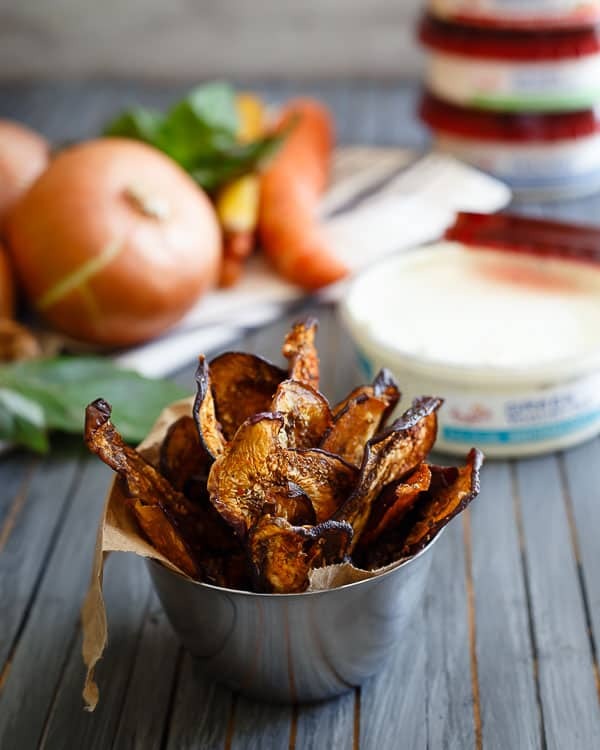 All the veggie benefits with the crispness and crunch of a chip…perfect. Since I still happened to have Brandy’s dehydrator at my house after making the buffalo sauce beef jerky, I gave it another go. This time with eggplant. I’ve more than once admitted I’m not an eggplant lover. Not a hater, just not a lover. Unless it’s fried to a crisp, it’s pretty hard to get me to enjoy the mushy purple veg which is exactly why I chose to dehydrate it into chip form. Because I’m stubborn and refuse to give up on foods I don’t like and I had this sneaking suspicion when the mushy factor was all dried up, it’d make an excellent chip. And it totally did. 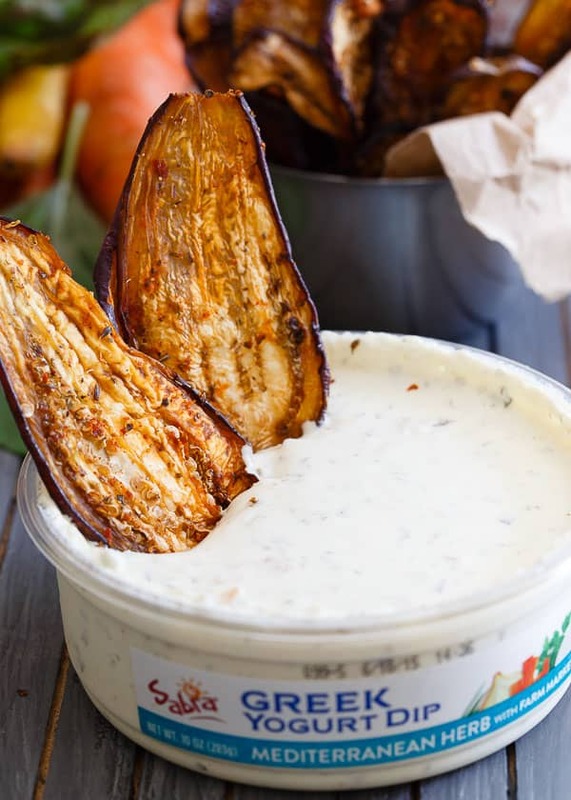 Seasoned heavily with some Mediterranean-esque spices, these eggplant chips make the perfect dippers for the Mediterranean herb dip or, any of the dips for that matter. I might be having a love affair with the diced onion lately. Place eggplant slices in a large bowl. Add olive oil and spices to the bowl and gently toss with tongs until each piece of eggplant is coated in the spices. Place the eggplants slices on the trays of a dehydrator and dehydrate on the fruits/vegetable setting (about 135 degrees) for 4-5 hours until fully dried and crisp. You'll want to check the trays around 3-4 hours as some thinner slices may be done sooner. Let eggplant cool completely before storing in a container. 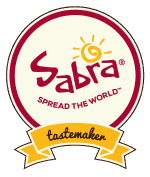 *This post is sponsored by Sabra as part of my work with them as a Sabra Tastemaker. All content and opinions are my own. So glad these worked out! They look so good! What a fun experience! I just noticed Sabra dips in the supermarket but didn’t know they had more besides hummus! The eggplant chips look delicious! Mmmm! These look so savory and yummy Gina! Cool idea. I LOVE eggplant chips and they are perfect for dipping in hummus. What a fun trip! I need to buy a dehydrator, there’s so many yummy things to be made with it! Oh man, these eggplant chips look to die for! I love that dip too, I seriously need to get myself a dehydrator! Girl – you’re speaking my language!! Love these and love Sabra yogurt dips! This is such a wonderful, creative idea!! I never thought to make eggplant chips, or anything like this! I’m a sucker for all these flavors – can’t wait to try. Sabra’s got it going on! Also….these chips? Amazing! I heart eggplant, and these sound so good! oh my gawd, I love these!!! Yum yum yum!!! 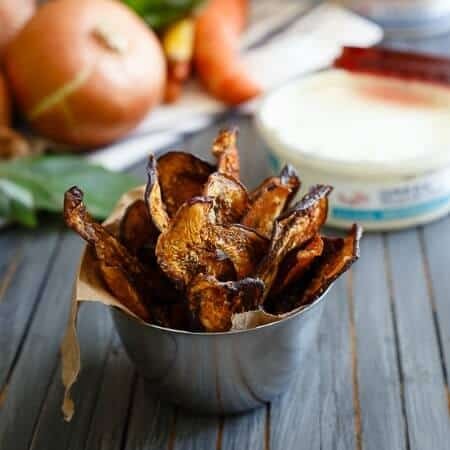 I made a Greek yogurt dip this weekend and this chip is where it’s at! Sounds like a fun little trip that you went on– super interesting to learn about the dips, I’ve never seen them in stores either but will be sure to be on the look out for them. I love the idea of eggplant chips! I love Sabra hummus but I had no idea their yogurt dips had fresh veggies in them. I just ordered my first dehydrator last week so can’t wait to try these chips. These look absolutely tasty! I love dried chips like these. Yum! Ahhh, you’re really making me wish I had a dehydrator. I would be veggie chip-ing it up all the time. I love these Sabra yogurt dips, and the one you’ve used here is actually my favorite flavor. Love the bits of veg in it. Pinned! Um, I need to get my hands on a dehydrator and that Sabra dip! I don’t think I’ve seen the yogurt dips before, they sound delicious! Your eggplant chips look incredible. Um, yum, I need eggplant chips pronto! I know this is a Sabra sponsored post, and I love and often purchase their products. However…if you’re lucky enough to live near a Trader Joe’s, they sell an amazing Greek Tzatziki dip that pairs well with the eggplant chips. I love to eat eggplant fries and these are next on my list. I cant wait to see if I can get them super crispy like yours! Pinned!